When I was in Germany last year, I was very impressed with their recycling facilities. Outside most supermarkets were reverse vending machines where people put their empty plastic bottles and cans and in return got a credit voucher to use in the shop. At the time, this level of recycling seemed light years ahead of Australia. 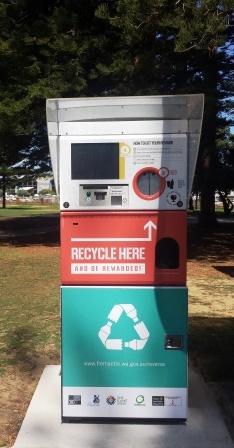 But Fremantle City Council has recently installed a reverse vending machine on the Esplanade that swaps your empty plastic bottles and aluminium cans for reward coupons. The initiative aims to encourage visitors to recycle their waste, to promote local businesses and to keep the streets of Fremantle clean. Reduce the amount of plastic making its way into landfill and the ocean. Currently, plastics make up about 60% of marine debris and an estimated 100,000 marine mammals and turtles are killed by plastic litter every year around the world. Save energy, as making PET bottles from recycled materials uses 84% less energy than producing them from raw materials. The reverse vending machine is very easy to use. 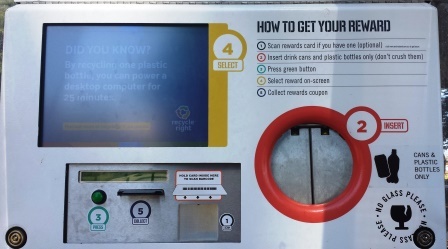 You simply put your empty plastic bottle or can into the slot, press the green button and choose your reward on the touch screen. The rewards change every six months and the current vouchers are valid until 10th March 2016. 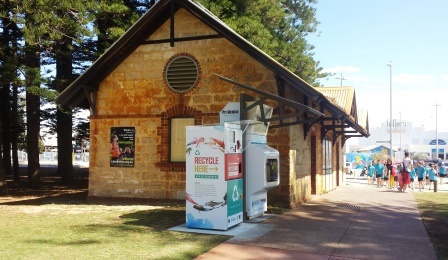 The reverse vending machine will be trialled in Fremantle for three years with a possibility of extension if it is successful. 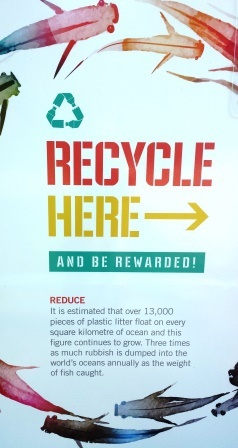 So get down to Fremantle and start reaping the rewards of recycling. Cost: Nil - you get rewards! What a great idea. Let's hope it encourages a stronger recycling culture. Great article. I grew up with these in wellington. They had a one arm bandit style and a single aluminium can was like a token for the machine. If you won you got either a fun sticker with a logo encouraging recycling, or a fresh can of soft drink. It definitely encouraged me to recycle as a youngster. These have been around since the early 90's in the U.S...good to see they are making their way here. Yes, so surprised that it has taken so long for these to appear here. Since most states in the US have a bottle deposit, the recycling machines are posted near the entry at grocery stores for easy returns and to instantly redeem credits at the register. Kids will pick up any extra bottles/cans for pocket money, so there are hardly any littering the landscape.